Each of the Eagle View Properties offer unique locations and interiors. 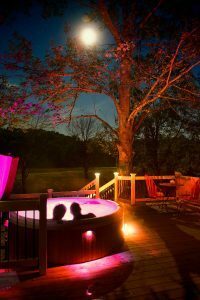 All of our Hocking Hills cabins feature private hot tubs and a unique setting. Eagle View Lake House is exquisite and it is our lakefront cabin rental right on Lake Logan! Eagle View Lake House sleeps of to 6 guests. Eagle View Retreat is the most traditional style Hocking Hills log cabin. If you are looking for a log cabin in the woods experience with the family this is it. Eagle View Retreat sleeps up to 10 guests. Eagle View Escape offers large rock formations on the property just like Old Man's Cave. Eagle View Escape sleeps up to 10 guests. Pets allowed, under 30 lbs. $20.00 fee per day.